An Iowa team begins play at the Little League World Series this afternoon. A team of 11 and 12 year olds from Urbandale is representing the Midwest Region and will play the first of three pool play games against the Southeast Region champ from Warner Robins of Georgia. That’s the same Little League that produced the World Series champion in 2007. 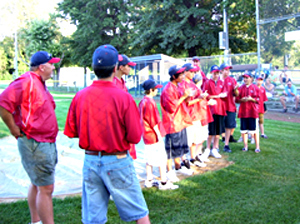 The Urbandale squad is the first Iowa team to make it to Williamsport, Pennsylvania since Davenport Northwest Little League represented the Midwest Region in 2005. The Iowans will be at a distinct size disadvantage. The average weight of Urbandale’s 12-player roster is 112 pounds while the Georgia team averages 140 pounds. That includes power hitting first baseman Cortez Broughton, who is 5-11 and weighs 226 pounds.